What is a Mitered Edge Profile? A mitered edge creates a seamless edge between the top of the countertop and a second piece of stone to create a specialty edge or to join a waterfall panel. The mitered seam allows the pattern to “wrap” from the horizontal surface to the vertical surface. The countertop slab material must be expertly cut at a 45 degree angle and perfectly mounted for the pattern of the stone to remain consistent. Mitered edges are commonly used to create a seamless flow from a countertop slab to a waterfall panel that extends to the floor. A mitered edge can also be used to add more stone to the underside of a countertop slab creating a distinguished look through the illusion of a thicker slab. Mitered edges can be used to hide the support structure underneath an island or to make smooth transitions between different level bar tops. Mitered edges are very common in commercial projects and are continuing to become more popular for residential use. Many fabricators are not comfortable fabricating a mitered edge and they may try to steer you to a stacked edge instead. Stacked edges are very popular, but you need to be certain that it is the look you want. A stacked edge may often be inconspicuous, but not invisible. Look for more information about stacked edges in our upcoming article “What is a Stacked Edge?”. A skilled fabricator cuts the edges of the stone at a 45 degree angle to form a frame of the slab material around the sides to make the slab look thicker. The seam should almost be invisible and the pattern of the material should flow from top to side with little variation in the pattern. It is difficult to achieve a crisp line without the proper tools and equipment, such as edging machinery. 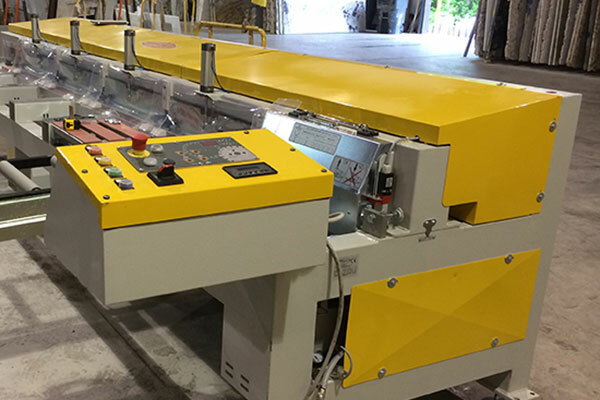 Many fabricators and installers choose not to offer a mitered edge because of the complexity of the process. If you wish to have a mitered edge you will want to hire an expert fabricator. What is a Laminated Edge? Laminate edge refers to the process of gluing pieces of stone together to create a variety of edge profiles including mitered edges, stacked edges, and drop edges. The lamination process can be used to create more sophisticated edge profiles, such as layering an Ogee Edge over a Full Bullnose Edge. This has nothing to do with traditional laminate countertops. 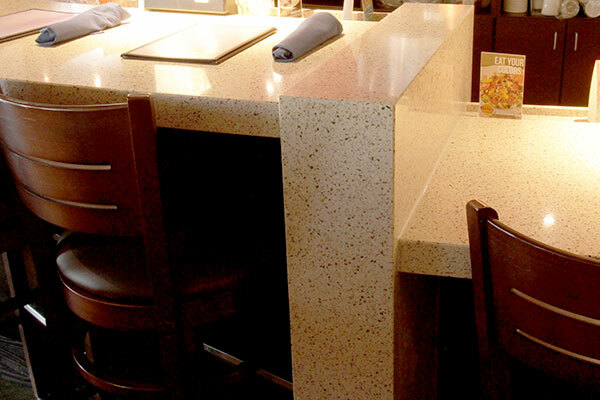 Mitered Edge Restaurant Bar Top at Brixx Pizza, Hoover, Alabama. Many fabricators do not offer mitered edges due to the difficulty and expertise needed to properly miter a stone edge. 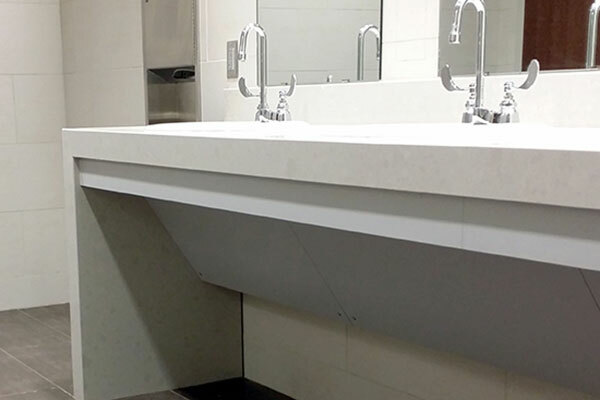 Surface One has extensive experience with mitering edges for commercial and residential projects. 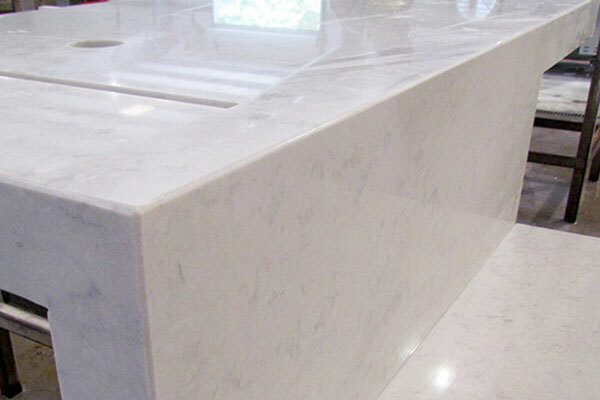 Both natural stone and quartz countertop materials can be mitered as well. There is no wrong selection when it comes to choosing an edge profile. Contact Surface One and our design team will help you select the perfect countertop material and edge profile for your project.